Say Hello to Krosmaster Blast! - FORUM KROSMASTER : Forum dedicated to discussions about Krosmaster. Share all your opinions, ideas and tactical tips! Say Hello to Krosmaster Blast! Krosmaster Blast is the new game from Ankama Boardgames that takes place in the Krosmoz universe. It will offer a fresh gaming experience, with quick, dynamic matches and accessible yet deep rules. The game will feature collectible SD-style miniatures, each providing new strategic possibilities and increasing the game's replay value. You can find out more now by visiting the game's official website: click here! 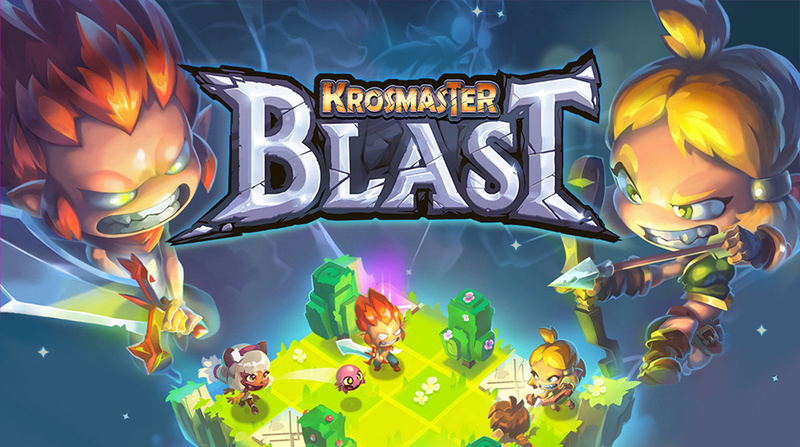 The Kickstarter campaign for Krosmaster Blast begins on October 31, 2018. You'll get to try a demo of this game before its release by joining us at one of many conventions, such as Gen Con 2018 (August 2-5 in Indianapolis), Brussels Game Festival (August 27-28 in Brussels), SPIEL in Essen (October 25-28), and many others. Be sure to mark October 31 on your calendar, and keep an eye on our social media pages (Facebook, Twitter and Instagram) for more details in the coming weeks! Yes to both of your questions. You will play your team each turn, and you can select the order in which you will activate them. Are the usual figurines and cards compatible with this new game board? We made it so the Blast characters can be played in Arena, and the "Gloomy Grove" season will be fully compatible with bost Blast and Arena. Other characters that may be unlocked during the Kickstarter campaign will also have cards for both games. Older seasons of Arena are currently not compatible, but we're currently looking for ideas to let you play with your favorite miniatures in Blast. Does this mean that the "Gloomy Grove" characters come with two cards? One with the horizontal layout and no references to Blast mechanics, and one with the vertical layout for Blast? If this is the case, I would likely buy the "Gloomy Grove" characters. Otherwise, I may have to stop collecting . TabletopAdept: you have switched around the horizontal (Blast) and vertical (Arena) cards, but you are correct! All Gloomy Grove characters will come with both cards. Thats a very good question. So Ankama thinks that the problem with Krosmaster Arena is that spell costing more than 1 AP are "Too difficult" for players to understand, and this is why the game lost popularity? Attention Ankama: It's your refusal to fix bad balance issues that is the problem, it always was the problem. Leaving Julith, the Army of OP level 1's, and other OP characters out there driving people away from the game is the problem!!! The mechanics of Krosmaster Arena are great. Different AP costs for different spells was not a bad thing. Having a character that maybe had a weak spell they can cast multiple times and a Strong spell they can maybe only cast once per turn instead, will be lost with this new 1AP for everything deal. Now the area control features of Blast may be a good thing, but reducing the cost of all spells to 1 does not seem like a good thing. It seems like it will hurt character specialization and diversity. You're oversimplfying the issue: the AP change is only one facet of the game. Compared to Arena, a number of other rules have been streamlined and simplified. There will still be decisions involved when playing a character, since attacks can still be limited per turn or per targets (like blue and purple spells in Arena). On a player's turn, do they activate both Krosmaster figures? Can the player choose the order they are activated?